I'm posting the following on behalf of my friend and fellow advocate, Rivka Solomon. Read on: Rivka covers everything you need to know to put on a successful demonstration! So you want to take a stand and make a stink -- do something more visible to help your ME/CFS community? Good for you. Consider organizing a demonstration (demo) to advocate for people with ME/CFS. Consider going public, alone or with others, in your call for more respect, more attention and, most importantly, increased government funding for research and treatments. Organizing a demo is both easy and a bunch of work. Do keep in mind this reality check: After all the energy output, you could have a mild or significant relapse. Yet also keep in mind that you will have raised public and perhaps government awareness about a devastating disability, and thus you will have done something important for the world and for your community. In the end, you will feel good about having done it. And you will have the gratitude of those who are too disabled to take this type of public stand that we all know needs to happen in cities and counties all over the globe in order for things to change -- most especially in front of national and government health care institutions, such as, in the U.S., in front of the regional headquarters of the Department of Health and Human Services (HHS) and the Centers for Disease Control and Prevention (CDC). Below is a simplified, preliminary -- and certainly incomplete -- checklist to consider as you organize your demonstration. It does not go into great detail, but skims over the basics, including, deciding the location of your demo, deciding the tone, reaching out to others, permits and arrests, reaching out to media and more. Remember, you can always do a mini-demo as a solo person with a single sign. In some cases, this may be a heck of a lot easier on your health, and it could still have an impact, especially if you get media attention or put it on YouTube and email the link to your national and government health care institutions. I have included video links of my own past public and bedridden demos below this checklist. Some were solo and some were group demos. a. You will likely want to be somewhere public, where there are passers-by, and/or where media can get to or where they may already be present. b. Ideas: City or federal building, health care building, blood giving location, outside (or inside?) a health-oriented meeting, perhaps at a meeting or talk that includes a noted government official. a. Decide how animated, flamboyant, cartoony do you want to be. Do you want to be dressed in business suits, jeans or more attention-getting costumes with some type of theme? b. Will you have signs or a banner? Will they be colorful, upbeat and playful, or serious? Home made or printed? c. Will do you something very attention-grabbing, such as a lie-in with sleeping bags, pillows, blankets? If you want others to attend, reach out to local ME/CFS groups. a. Ask: Will they join the demo? If yes, they will likely want to join the decision-making, too (i.e. location and tone). b. Ask: If not, will they at least help you get the word out for the demo in an email blast you write up that they distribute to their members? 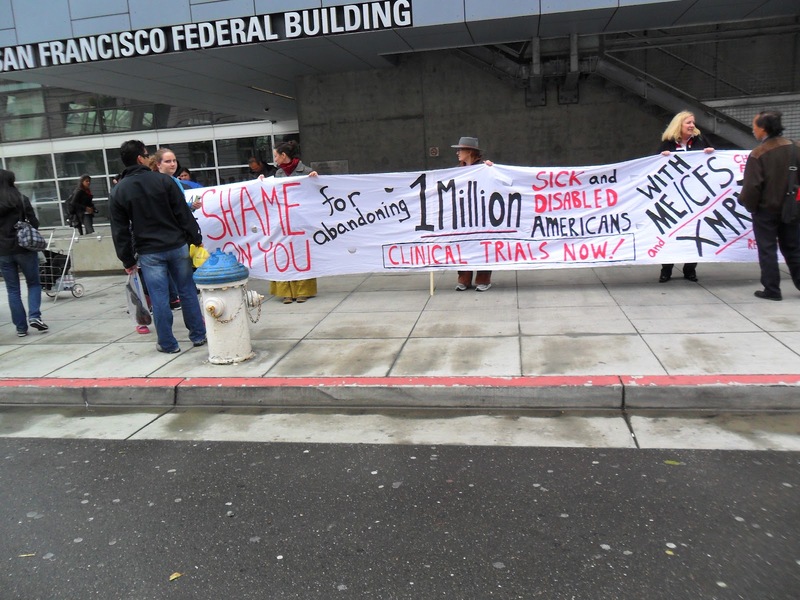 Young people and young adults with ME/CFS, or the kids of parents with ME/CFS, who attend your demo may get more sympathy from the media, government officials and the public. a. Contact national ME/CFS groups (e.g. contact Denise at SpeakUpAboutME@gmail.com, or contact the young adult online group called kickHeal) to see if they know any youth in your area that you can invite. b. Contact local families with kids who have ME/CFS. c. Ask local ME/CFS groups if they know young people with ME/CFS. If you want everything to be legal, find out in advance what is needed in terms of permits. b. Consider telling the police/security that it will be a demo of people who are disabled and who have been ignored by the government. This may win you some sympathy and extra flexibility. Or not. c. Find out from the police/security folks of the building the rules of how close you can be to a federal building, and what is not allowed (e.g. I found out that sticks for holding signs are not allowed in front of the White House in Washington DC, and that you have to keep moving, and can't sit still). d. Another idea is to *not* find out about permits and just do your demo without permits. It could cause a bigger splash if you surprise the security team, or not -- no one really knows. It is not likely they will arrest you, even if you need a permit but don't have one. It is more likely they'd just ask you to leave. And then you can just decide to leave. This could make for a short demo, though. Nothing is known for sure. a. Find out what could happen if you are arrested; really find out, as I have no idea. Will you go to jail, or simply get a ticket? Will you have to go to court later? Pay a big fine? b. Have a lawyer ready to help you if you are arrested. d. Will you need your medications while in jail? How will you get them? e. Find out ADA (Americans with Disabilities Act) regulations in terms of disabled folks on U.S. jails. f. Get educated: Read up online about getting arrested as a result of demonstrating. a. Find out who runs that office (i.e. in the USA, the local HHS or CDC regional office), and also who is in charge of public relations there. b. When you ask for a meeting, and/or once you secure a meeting, decide if you want to tell them about yr demo in advance or not. There might be pros and cons to letting them know you will be demonstrating that day, and pros and cons to not telling them until you are actually there with your sign. c. In the USA, there are 10 HHS regional offices (http://www.hhs.gov/about/regionmap.html) in Boston, MA; New York; Philadelphia, PA; Atlanta, GA; Chicago, IL; Dallas, TX; Kansas City, KS; Denver, CO; San Francisco, CA; Seattle, WA. Plus, there are 10 CDC satellite offices in Anchorage, AK; Cincinnati, OH; Fort Collins, CO; Hyattsville, MD; Morgantown, WV; Pittsburgh, PA; Research Triangle Park, NC; Puerto Rico; Spokane, WA; Washington, DC. d. Each of these above listed government sites is just calling for a small group of 1 to 5+ ME/CFS patients and their families to stand in front, on the sidewalk, demanding to be heard -- even for just 15 minutes. 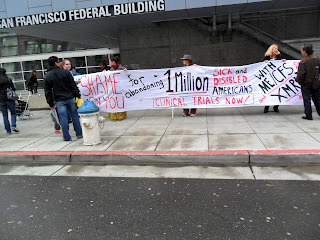 Each head of security of each site will be mandated to let their national headquarters know that there was a person there that day, holding a sign in front, protesting HHS/CDC's policies and lack of funding for ME/CFS. Eventually, with enough mini-protests, this will impact U.S. health care policy. e. There may be special considerations in terms of where you can demonstrate at a government building. See section above called "Permits" for more info. a. Send out a short but appealing press release. Could send to print, radio and TV media. Send it via email, and also call all local newspapers and radio (you could ask me for a sample press release I used in the past). Pitch to a variety of press/media, such as health reporters, living reporters, city desks. Simply call the newspaper's main number and ask who covers those beats/sections, and who is the editor of each section. Pitch to both the individual reporter and their boss, the section editor. b. Try to pitch to reporters and editors "live" (via phone), or leave your animated pitch on their voicemail. In other words, don't just rely on emailing your pitch, but do email it, too. c. Make sure you have a compelling story. For example, I wrote: "For much of the past 20 years, I have been bedridden or homebound with an illness that 1 million Americans have, but that gets almost no government funding for research." And, "We are a mother and daughter team protesting together in hopes to secure funding for the sick daughter who has spent much of the past 20 years bedridden or homebound, along with almost 1 million other Americans." d. Have a local angle: Tell them you are from the area. e. Include in the press release why you are there protesting and what you want (e.g. more government funding for research into the causes of ME/CFS, and treatments and clinical trials now!). f. If you don't reach reporters (phone or email), keep trying up to 3 times. They are busy and I have sometimes gotten a "Yes, I'd like to write an article about this," on the 3rd try. After 3 tries, you may want to give up or be considered a pest and a bother -- which is, we know, not the end of the world. The squeaky wheel gets the most attention. g. Consider a teleconference. It is when you have a press conference via phone; the press calls in to ask questions of a panel of patients, family members, expert doctors or whomever you decide to have present. This will take some organizing and work. h. Remember: Once you do a media interview, or have the media present at your demo, you will have no control over what, in the end, they say or write about you and no control over the spin they give the piece. It could be positive or negative. And please know this one thing now, before your interview (if you do have one), they will likely misquote you; they almost always do. You can reach out to other groups to invite them to join your demo. This is a big task. Plus, be ready for rejection. d. Compassionate healthies, like the local Rotary Club, women's sewing circle, etc. a. Have a one-pager to give the government official you meet with -- or don’t get to meet with, but you will then leave the letter/one-pager for them at the front desk. b. The same or similar one pager can be given to passers-by (for educating the public), the press, and for mailing to the government officials later. Or write up a smaller, colorful card for passers-by. c. This same or similar one-pager can be your prepared speech, if you want to give one to the public, the press or videotape for a video. d. Include in the one-pager why you are there protesting and what you want (e.g. more government funding for research into the causes of ME/CFS, and treatments and clinical trials now!). a. Not much to say here except be creative! b. Below is a link to how I made a 25 foot banner (I bought paints, paint brushes and a large bolt of cloth all at once, at a local fabric store). I knew I would not have a lot of people at my demo, but I still wanted to take up a lot of space and get a lot of attention -- hence the 25 foot banner. a. Consider doing what the wise organizers of the 2010 London protest did: organize vans to pick up folks from their homes and bring them to your demo. b. Consider having folding chairs, wheelchairs and cots there for folks to sit and rest. Decide if these wheelchairs and cots will be a good or bad thing in terms of PR (public relations) and the media. This was discussed already above, but once again, consider all media drawing tactics, and if you want to do them or not. a. Using a huge banner you make or have made. b. Die-in or lie-in with pillows and pajamas? (If so, be ready for risking arrest). c. Blocking doors (again, be ready for risking arrest). d. Disrupting a meeting with a government official. Videotape your demo so that you can get it on YouTube and the ME/CFS community can see it and be inspired. a. If possible, have at least two video cameras (Flip cameras are cheap and easy to use) and two camera people, in case one camera fails or one person does not show up. Have a still-camera or phone, too, for still photos. b. Videotape the images and audio you want. You will likely want to include your homemade signs but also the official sign that includes the actual name of the building you are in front of (e.g. Red Cross, HHS, CDC, any government name). Also, include in the video the people who came who have agreed to be videotaped, and your own prepared or spontaneous speech. Videotape the speech and all images at least twice, since audio or lighting or something will likely fail in one of them. I speak from experience. c. Edit the video to be less than 5 minutes long, and put it on YouTube. d. Send a link to the video to government officials and press. e. Contact any ME/CFS blogs or forums and ask if they want to post a link to your video. a. Write up a short description of the demo, written in your own words, and distribute it to the ME/CFS community. This will inspire others to go out and lead demos of their own. b. Include in your write-up a link to your video and to any media attention you got. That is it! Remember, your demonstration will make a difference, it will have an impact. The below videos are related to my ME/CFS demos and activism in 2010-2011. I hope they may inspire others to demonstrate, too.